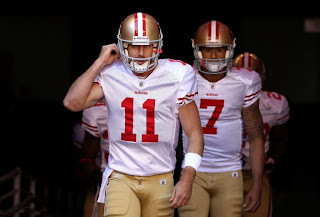 Is there a quarterback controversy brewing with the 49ers? 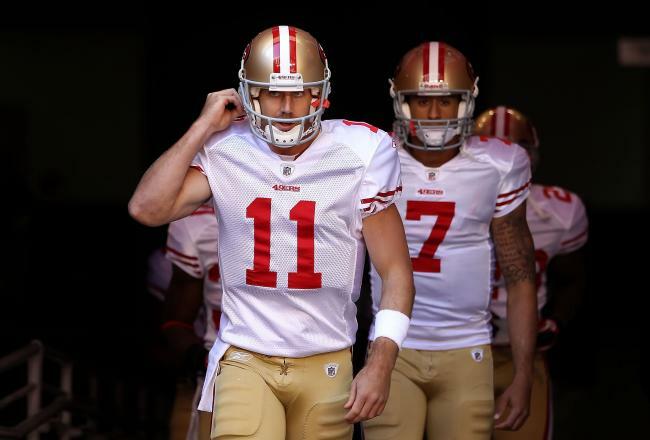 If you watched the Seahawks-49ers game last night, you saw something different with Alex Smith. It appeared that the team may be losing confidence in Smith, and that Smith may be losing confidence in himself. After an awful performance last Sunday against the Giants, Smith only threw the ball 23 times against a strong Seahawk defense and half of his 14 completions were to running backs. What was even more fascinating was how conservative the offensive coordinator, Greg Roman, called the plays when the 49ers were up 10-6 late in the fourth where they took the ball out of their quarterback's hands and played for the field goal, which ended to be enough. So the question must be asked, is there a quarterback controversy on the horizon in the Bay Area? It was not something to be expected with the club this season, but it seems that the coaching staff loves themselves some Colin Kaepernick. Drafted a year ago out of Nevada in the second round, Kaepernick did not see really any playing time last season as Smith broke out and it was expected to be the same case this season. But first it was using the athletic Kaepernick in the Wildcat and then they have started to have the 24-year old use his strong arm to mix it up. Now you see him for whole series at a time, providing a much different playmaker at quarterback and you have started to see some folks start to wonder if he is the real quarterback of the future and as someone who was a big fan of Kaepernick coming out of school last year, it is something that I have thought about. And you have to wonder if Smith's confidence has been jerked around by the organization too much that it may be too late to fix it, which is odd considering how well he played last season. But you saw it from the organization tried to lure Peyton Manning to San Francisco after Smith and the club surprised everyone with a 13-3 season and an near-victory in the NFC Championship Game and Smith pondering an offer from the Miami Dolphins. Now you see the team starting to unravel Kaepernick more and more but the team seeming to get more conservative in their play-calling now with Smith, you wonder if we will see Kaepernick getting a start or two late this season, or if not earlier.